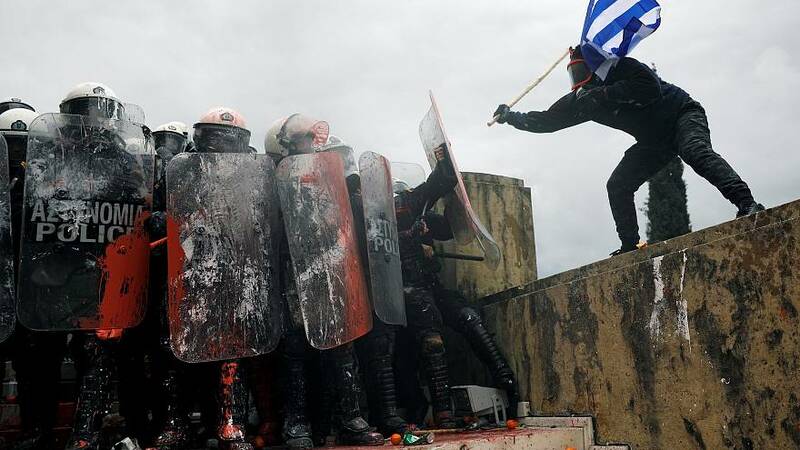 Thousands of Greeks have protested on the streets of Athens over a deal with the neighbouring Republic of Macedonia about the country's name. An estimated 60,000 demonstrators gathered in Syntagma Square, outside parliament, chanting slogans including: "Macedonia is Greek." Meanwhile, Prime Minister Alexis Tsipras is preparing for another showdown in parliament over the so-called Prespes agreement. It means Macedonia will be renamed the "Republic of North Macedonia" in order to end Greek opposition to it joining NATO and the EU. Greeks from all political parties feel strongly about the issue which has led to many similar protests over the past year. Watch: Why is the FYR Macedonia name change deal so significant?